At last, Winter is coming to an end. And what better way of saying goodbye to this strange winter that with a few glasses of peat medicines? In the quest to taste all the stuff that I have ordered, I have decided for five magnifique drams: Arran, Ardmore and three Bruichladdiches. You know that a have a little sweet heart that loves peat. I adore peated whiskies but on this tasting I have found a whisky that it is just too peated for me. Much like sucking mud! A young peated Speysider from the excellent Ardmore distillery, this has been finished in quarter casks to speed up maturation (just like stable-mate Laphroaig's QC offering - perhaps the same casks?). Nose (90): more than average. honey, peat, citrus, vanilla, spices, apples, bananas, candies. Delicious touch of peat. Palate (91): powerful, oily. peat, honey, citrus, wood, earth. Just the right amount of the right type of peat that I needed. Sweet marvelous treat. Finish (90): longer than average. peat, citrus, honey. So based on other whiskies I have already tasted I rate this Ardmore Traditional Cask with 90 points over 100. The second batch of Arran's peated 'Machrie Moor', named for the ancient peat bog on the west end of the Isle of Arran and with a picture of Bran on the bottle, the faithful hound who accompanied legendary giant Fingal around the island when not tethered to a standing stone on Machrie Moor. Nose (89): more than average. honey, peat, fruits, citrus, mango, pears. Palate (90): powerful, oily. honey, peat, citrus, vanilla, spices, fruits, strawberries. Finish (89): longer than average. honey, wood, fruits, peaches. So based on other whiskies I have already tasted I rate this Arran Machrie Moor / Second Edition / Peated Island Whisky with 89 points over 100. The first ongoing release of Bruichladdich's heavily peated Port Charlotte. Aged for 10 years and showing off a mix of Bruichladdich's elegant spirit and big, smoky peat. Nose (90): strong. peat, earth, mud, honey, citrus, spices, fruits. Massive peat with lots of earthy notes and fruits. Palate (89): powerful, oily. peat, earth, citrus, honey, vanilla, spices, wood. Write it down! You won't read again this from me! This dram has just too much peat. Finish (89): longer than average. peat, citrus. So based on other whiskies I have already tasted I rate this Port Charlotte 10 Year Old Heavily Peated with 89 points over 100. A non wine finished Octomore, this was peated to 152 ppm and aged for 5 years. This is the peatiest Octomore yet! Nose (89): more than average. honey, citrus, peat, wood, pepper, vanilla. It's peated, right, but it isn't as massive as you would think. Palate (92): powerful, oily. peat, honey, citrus, vanilla, pears, wood, earth. C'est magnifique! Finish (91): longer than average. peat, citrus, vanilla. So based on other whiskies I have already tasted I rate this Octomore 3.152 with 91 points over 100. More smoky insanity from the folks at Bruichladdich, this time with the barley peated to 167ppm. This Octomore is named for Comus, the son of Bacchus (the Roman god of wine and partying), and has been finished in a Sauternes cask. Nose (88): more than average. citrus, honey, fruits, grapes, spices, peat. Palate (92): powerful, oily. peat, honey, citrus, spices, wood, earth, floral, fruit, ripe apples, pears. Finish (91): long. peat, citrus, fruits. So based on other whiskies I have already tasted I rate this Octomore 5 Year Old / Edition 4.2 / Comus Islay Whisky with 90 points over 100. Oh, what to say… a lovely tasting session. Really, I love Octomore, delicious whiskies all of them but the price step makes harder each time to buy it… I just in fact decided not to buy Octomore 10 years old. I am pretty fond of Ardmore Traditional. I have tasted a few independent bottlers Ardmore and they were quite good but never had a chance of tasting any of the distillery bottles. I see why this is the heart of Peat Monster vatted (oops! 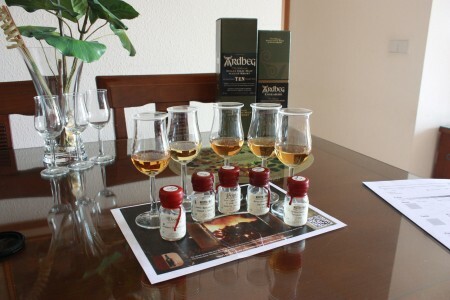 Blended malt, I mean blended malt) whisky: peated and deliciously honeyed sweetness. The biggest surprise is Port Charlotte that it is almost unpleasently peated. I have tasted some of the PC range and I love them so I bet that watering them to 46% did little favor to it. Not bad anyway, I could live drinking it. See you on the next tasting.